Do you want to grow your email list so you can reach more customers, generate more sales, and grow your business? Knowing the best email marketing strategies is the best way to build an email list. And fast. In this article, we’ll show you some of the easiest ways you can build your email list so you know any time you launch an email campaign, you’re reaching the widest audience possible. Sometimes the best way to get people to subscribe to your email list is to just ask them to. But you have to remember, people don’t want to deal with the hassle of filling out long, complicated forms, even if they want to subscribe. Notice that the more fields you make visitors fill out, the less likely to subscribe they are. That’s why using a forms plugin such as WPForms is one of the best list building strategies. Not only is it beginner friendly, it’s user-friendly too. With WPForms, you can build your email list in two ways. WPForms does more than integrate easily with popular email service providers such as AWeber, MailChimp, GetResponse, Drip, Constant Contact, and Campaign Monitor. It also allows you to embed your signup form anywhere on you want on your WordPress site. Add it to your posts, pages, sidebar widgets, and even footer sections using shortcodes. This guarantees site visitors have the chance to subscribe no matter where they are on your website. Not to mention, you can create other cool forms that ask people to sign up like order forms, login forms, and even donation forms. Giving people a solid reason to subscribe is one of the easiest ways to convert more subscribers. Offer optin incentives such as eBooks, swipe files, free software tools, access to exclusive online courses, white papers, and even resource lists and watch your email list grow. 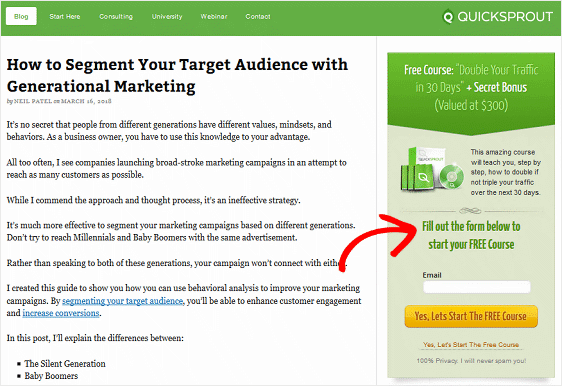 For instance, Neil Patel offers subscribers access to a free course on his Quick Sprout blog, which is valued at $300. This entices people to sign up because not only are they receiving something of high value for free, they don’t want to miss out on learning how to drive traffic to their website. 50% of marketers that offer lead magnets to encourage signups report higher conversion rates. 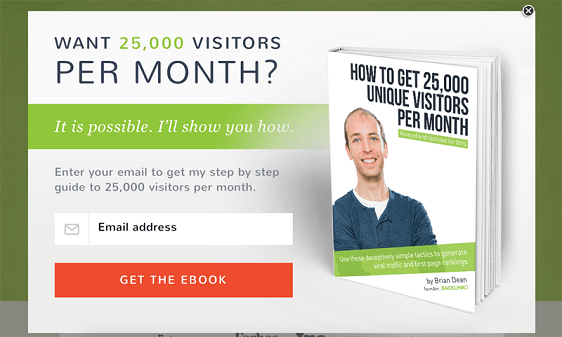 If you use this simple method for building a bigger email list, chances are high your subscription rates will increase. Using a lead generation solution such as OptinMonster is another quick and easy way to boost your site’s conversion rates. Especially if you want to create cool looking popups on your site. Better yet, take advantage of OptinMonster’s Exit-Intent® technology and target visitors as they are about to leave your site. This gives them one last chance to consider subscribing before they leave for what may be forever. Make it even more enticing by adding an optin incentive such as the ones mentioned above. OptinMonster differs from WPForms in that it offers multiple form types such as lightbox popups, slide-ins, sidebar forms, floating bars, and more. This means you can have your pick when it comes to choosing which type of subscribe form you want to add to your site. In addition, you can A/B test your subscribe forms, access built-in form analytics to make sure your email list building efforts are working, and enable page-level targeting so the right forms appear before the right audience. You can also use creatively placed MonsterLinks, that when clicked, enable a popup to appear. Try this technique and you might boost conversion rates as much as Sportique.com did – a whopping 58% throughout their site, and an even more impressive 79% on the cart page alone. If this sounds like something you want to do, check out OptinMonster’s full feature list. People love to make decisions on whether to subscribe based on their initial impressions. That’s why using social proof on your subscribe forms is a great way to give your site visitors the perfect first impression and convince them to subscribe right away. You can add any of these types of social proof to your subscribe forms, but one of the most commonly used is wisdom of crowds. Using the sheer power of numbers to show how reliable you are is a great way to prove to new site visitors that subscribing is worth it. For example, Buffer adds how many subscribers you would be joining if you too subscribe to their email list. After all, if hundreds of thousands of people have already handed over their email address, it’s safe to say joining the ranks is a good idea. Gated content is content such as articles, white papers, videos, etc. that can only be accessed by site visitors that have filled out your WordPress form and provided an email address. 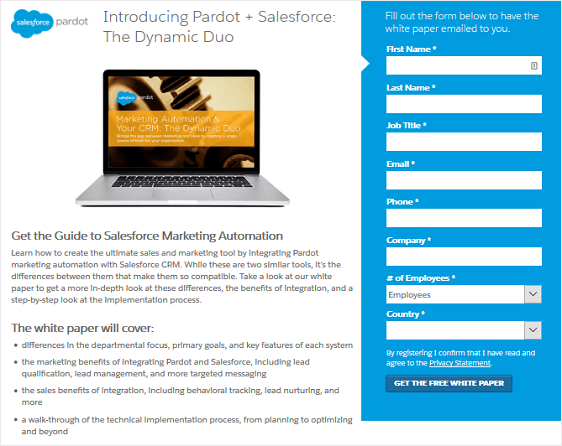 For instance, Pardot does a great job of gating a white paper. They preview what’s in the white paper, which generates interest, and then require you to subscribe to see the real deal. Gated content makes growing your email list super simple because you’re using content you’ve already published, as opposed to lead magnets or content upgrades, which take time to create and have to be changed or updated from time to time. There’s no denying that killer blog content reigns supreme when it comes to building a large following, generating more sales, and establishing a solid reputation. But interactive content can be a whole lot of fun for people too, and happens to be a great way to gather more email addresses from site visitors. 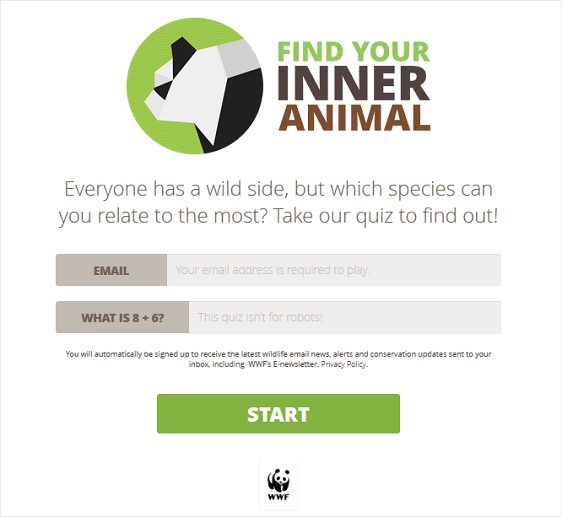 If you want a unique way to get people to subscribe to your email list, that’s also pretty simple, do what the World Wildlife Fund does and create a quiz that requires people to subscribe to take. If you prefer, because you feel asking for an email before taking the quiz may put some people off, ask for an email after site visitors are done taking a quiz in order to get results. You might frequent forums like Quora on a regular basis to find out what your target audience is talking about, to generate blog content ideas, and to promote your brand. But did you know you can also interact on forums like that to build your email list? 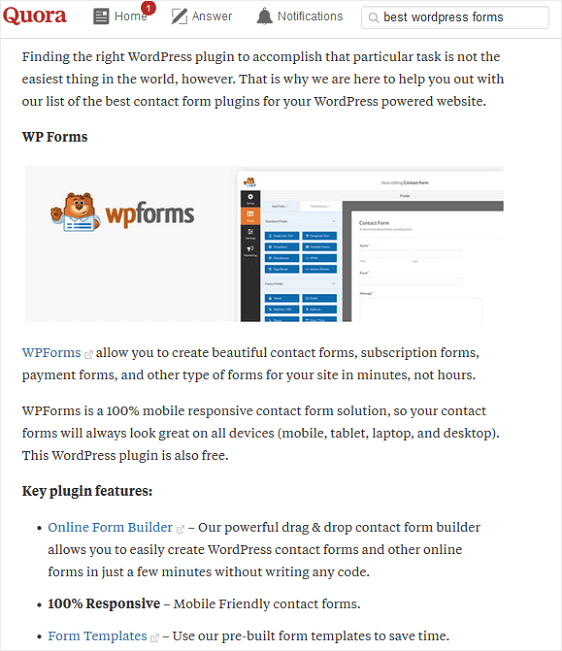 Try answering questions on popular forums, leaving a link to your site’s landing page that has a WPForms newsletter signup form on it, and getting people to subscribe to find out more on the topic that was answered in the forum. This strategy works because you’re showing people in forums that you are real and care about what people are taklking about. It also drives people to your website that you know are already interested in what you have to talk about, making your chances of converting visitors into subscribers more likely. You can also use forums to find great ideas for lead magnets that you add to your subscribe forms. After all, if you know firsthand what people are wondering about, you can use that information to create a lead magnet. People fail to fill out your WordPress forms for many reasons. For example, they worry about spam, misuse of their personal information, and hackers stealing their data. You can also make it clear and easy for people to unsubscribe if at any time they want to, so people never feel trapped and don’t feel the need to mark your emails as spam. And that’s it for today! You now have four super easy ways to grow your email list starting now. If you are looking for ways to optimize your mobile device lead generation strategies, check out how to optimize your forms for your mobile audience. And if you’re in need of a new email service provider, but aren’t sure which one to choose, check out this roundup of the best email marketing services, complete with free options. If you like this article, then please follow us on Facebook and Twitter.